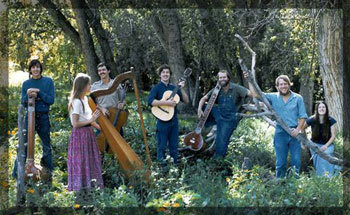 The Trees Community (also called "The Trees Group" or "The Trees", or our original name - "The Symphony of Souls in Christ") were a 1970's Christian religious community as well as a music group. 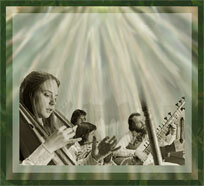 The Trees are reknowned for original liturgal compositions played on over 80 instruments from all over the world. These were frequently performed in churches and concert settings throughout the US and Canada. The Trees Community was a religious order of the Episcopal Church in America, based at the Cathedral Church of Saint John the Divine in New York City. Originally, the Trees had no church association. In our travels we gained several close associations with other communities, including the Episcopal Cathedral Church of St. John the Divine, the Methodist Korean Community of Jamaica, Queeens, The Abbey of Gethsemani (Roman Catholic) in Trappist Kentucky, The Abbey of Our Lady of Guadalupe (Roman Catholic) in Pecos, New Mexico, the Church of the Redeemer (Episcopal) in Houston, Texas, and the Community Church of the Brethren (Hutterite) in Bright, Ontario. The Trees Story began in the summer of 1970 with a group of disparate teenagers and young adults looking for the truth. One at a time we stumbled after it, through an old door with no lock, into an abandoned factory loft building. Up four flights of dark and broken steps, we carried the shadows and brokenness of our young lives. Our destination was an attic junk closet transformed into a would-be temple. Here, at the corner of 4th Avenue and 12th street in New York's East Village, from several to over 40 regulars, friends, acquaintances, and strangers met in the reclaimed room that we just called 'the loft'. Under the improvised light of hurricane lamps and Christmas tree bulbs, surrounded by our original art hung on open brick walls, over dinners of black beans, brown rice, and homemade sourdough bread, we came not to party but just to really talk, discuss, and learn. Our "search for truth" included meditational disciplines such as Buddhism and Yoga, where we learned the discipline of meditation. The ability to meditate taught us to really listen. Listening enabled us to really hear people out and learn new things, and made the unexpected possible. Whether in meditation or through social interaction, we were able to hear the unanticipated answers to our questions. After turning the whole world upside down to find the truth, each of us found that it had been with us all along, but hidden by the noise of familiarity. Each of us had come from different Jewish and Christian backgrounds, both Protestant and Catholic. In searching for answers, Western religions were nearly ruled out based on personal baggage with painful experiences, and aversion to dogma. In this mix of bad memories and stifling religious practice, "Jesus" represented an idol to us, rather than an icon. Now, however, with all pre-conceptions stripped away, and all of our images of what Christianity meant destroyed. we were ready to engage in what writer Marcus Borg calls "Meeting Jesus Again for the First Time". For some this re-encounter was Pauline, as when Shipen fell out of a tree after being struck with Spirit. But for others becoming Christian was a more gradual set of steps. Within only a few months a new, common faith prevaded in the loft. We had each experienced the welcome of our being in the private embrace of an indellible God. That embrace and faith would remain with us through our entire lives, well beyond the six years of our community existence. From this personal awakening a new shared communion occured in the loft, and with that communion a different level of commitment. We were no longer a commune but a community. The communion sounded in the spontaneous music of worship. Whether with sound or in silence, the mystery and magic of that time defied explanation. Most who took part in this early gathering never wanted to leave, including a cult deprogrammer sent by a worried mom. Many of us did in fact stay, for a few days, a few months, several years, or the full eight years of the group’s existence. We would vary in size, growing as large as fourteen, and stabilizing at seven members. Our first name was the New York Tent City Symphony of Souls in Christ. We then changed our name to the Trees Community (aka. the Trees Group). In May of 1971, the Loft that we jokingly called "the spiritual center of the universe" was scheduled to be destroyed by a wrecking ball, and become a parking lot. Within a few years, as with so many Manhattan real estate reincarnations, condominiums were built on the site. Even before this event, or the problems leading up to it such as the power and water getting turned off, we had considered, and planned for, our next move. With 600 dollars in cash between us, we left New York in a GMC School bus converted into a camper so we could cook and sleep as well as travel on the bus. Packed into the bus were a full kitchen, convertable beds, a pot belly stove for heat, our few napsacks, all of our musical instruments, fourteen people and two cats. When we left the city wee had no itinerary and were beginning our journey on pure faith. Gradually, our journeys, while continuing to be nomadic, were at least more organized as we pre-planned our visits and concerts in various Churches, religious communities, sacred spaces, and music festivals. From our first stop at the Jesus Movement "The Love Inn" through frequent interaction with the "Charismatic Movement" as well as many visits to monestaries, there was continued pressure for us to become part of a church community. Within only a year we would establish a denominational affiliation with the Episcopal Church, and specifically "a church" no less in stature and personal importance to us than the Cathedral Church of St. John the Divine. Today, some thirty years have past since our brief but timeless existence together as a community. We have each branched out in our separate lives. Four of our brothers have passed from this life, including our founder, Shipen Lebzelter, and mentor, Canon Edward Nason West. Our story and music are shared in their memory, for our children, and for all generations. Music, in its melody and dissonance, grew out of our search for truth and was built on our common, monastic life. At first it played through us in complete surprise, as sounds from all over the world came to us in prayer. From this root of listening The Christ Tree evolved, its branches forming a woven tapestry including Balinese chant, American folk music, Indian raga, African rhythm, Tibetan ritual gong, and Mexican bell wheel Sanctus. These and other musical signatures from different nations and cultures, from ancient to contemporary, are heard in our meditation performed with over 80 acoustic instruments. From its initial formation in our eary common prayer, the music was written in ways difficult to explain, except by an aclamation of faith in moments of spiritual inspiration, and sheer perseverance when times were tough. In all cases the music came to full fruition through a community experience where music was not formally written down. At the same time there were definitely musical leaders among us, notably Katheryn "Shishonee" Krupa who sung and invented many songs and melodies on the Venezualan folk harp. William "Shipen" Lebzelter" played Sitar in all of its range from traditional Raga to improvisational tonality, as well as the Indian Shehenai (chanter). David Lynch played and composed the flute melodies whether on classical or Native American or African flutes, and also sung and played the guitar melodies that he created. Philip "Ariel" Dross played the droning Tamboura (Indian bass) and cello, except for Psalm 44, where it was played by Shipen. Mary McCutchen played the harmonium (Indian hand organ), StephenGambill played Koto and Bruce Gambill played the Dulcimer. David Karasek and Marguarette Blythe were the main percussionists. Several of the instruments were shared - including switching musicians within a given song. We just picked the ones that we wanted to play that communicated how we felt. These choices might just befor one meditation, or a usage pattern emerged. Influences in our music ranged from the Incredible String Band and Moody Blues to Indian Raga and Balinese Monkey Chant, from traditional American sacred folk music to Terry Riley, Steve Reich, Charles Ives, Bela Bartak and Claude Debussy. Otherwise the songs and words were purely spontaneous, soulful expression, giving us our first name, "The Symphony of Souls." The Music lyrics were often biblical, most frequently from the psalms that spoke to us in the full range of human interaction with God from alienation to praise. The lyrics might also come from a poem such as Stephen’s Jesus He Knows or Katheryn’s Such a Love. All of our lyrics may be found on this site within each song playlist. The Christ Tree CD Box Set (a 4 CD compiliation) has sold out. This was published in limited quantity . visit our publisher's web site at Dark Holler • Hand/Eye Web site: www.somedarkholler.comAfter following this link, click on the tin man image to enter the site. The ebook Seven Story Bus, written by Kathryn (Shishonee) Reutenik is an depth in book on Trees Community. It contains an accounting of our day to day life in the group, with many photographs. This eBook is hosted at Blogspot.com. Click here to read it. The original Christ Tree LP was released in 1975. From that time until 2006 no efforts were made to create a CD, mainly because all of the surviving Trees members felt that the effort presented to many technical challenges. African belanji, Japanese koto, Native American flute, Tibetan gong and Mexican bell wheel lead the 80 plus instruments that bring rhythmical waters from across seven seas to awaken the Christ Tree from its seed in the earth. Rich soil begins to nourish the dormant seed and life begins to stir it. In its cradle, the seed innocently starts to sink its tap root, helped by the warm sunlight. But as its root continues downward, it encounters a large rock. Undaunted, it finds its path to the deep soil. At the same time, its first shoots break free of the earth to embrace air and light. The Trees Chant sung by Shipen Lebzelter, who also wrote its lyrics. The background monkey chant as well as the foreground melody are from traditional Balinese Music. In Bali the musical form is called "kecak", because of the imitative sound of monkeys. The most well known recording of Balinese music to date is titled "Music From the Morning of the World" and this LP (now a remastered CD) was our direct inspiration. Once sour, now sweet as can be. But now its oil is a healer. But the apple has much more to do. But to taste is the final test. The pomegranate is a traditional symbol of fertility, birth, and spiritual rebirth since ancient times. Since the beginning of Christianity, it has been a symbol of Christ's resurrection. For the Trees Community, the pomegranate is also symbolic of "the tree bearing fruit", as in our contributions as a community, whether in music or in other forms of service. The Christ Tree begins with Psalm 42, in the soil of the human condition, in alienation that begins with the lowest note on a mournful sitar, singing in terms of separation ("so my soul longs for you, my God"), and then despair, culminating in a chant of sheer vocal rage at God ("why do you forget me?"). After venting frustration a counter-voice of hope is awakened, pleading with the soul to have faith, beginning as a lonely chant woven around a plaintive flute, embraced by the soothing harp and a growing, harmonic community of instruments and voices. Concealed in the face of God. I have no food but tears day and night. When shall I see your face? Where is now your God? How shall you save yourself? Why so downcast my soul? Your breakers, have rolled over me. A prayer unto the God of my life. Put you hope in God. Adopted from Psalm 42 (the Jerusalem Bible translation), this original work's core melody and song are by Katheryn “Shishonee” Krupa. The music was then arranged and otherwise embelished collectively, with somewhat different variations evolving over time. In Psalm 45 we cross time to the age of Solomon and celebrate the wedding of a maiden to a king, and experience the timeless wedding of the human soul to God. Katheryn "Shishonee" Krupa created the work's core melody and song. The music was then arranged collectively, with somewhat different variations added over time. Just about all of our instruments are heard in the piece, as well as several musical solos by Katheryn and David Lynch. Among the more interesting instruments : Katheryn's Venezualan folk harp, a lyrical twelve string guitar played as a dulcimer by Bruce Gambill, and a proclaiming shehnai - an Indian oboe similar to a bagpipe chanter. The shehnai is used traditionally to announce weddings in India. Flutes, bells, gongs build upon the instrumentation, as the Christ Tree opens its branches in upbeat praise. Lyrics are adapted from Psalm 42 (Jersusalem Bible translation). To the king I must speak this song I have made. To the king I must sing this song I have made. For you God has blessed forever. O mighty one, strap your sword at your side! In majesty and splendor ride on, ride on. In your dread right hand! Nations lie at your mercy. Your royal scepter is integrity. Your throne, O God, shall endure forever. With the oil of gladness above other kings. All the virgins love and honor you. Your robes are fragrant with aloes, myrrh, and cassia. From ivory palaces you are greeted with music. To the Lord I must give this love I have found. This love I would make mine. The King desires your beauty. He is your Lord; bow before him. The wealthiest nations with jewels set in gold. The daughter of the King is clothed in splendor. Amid cries of joy and shouts of praise. You will make them princes throughout all the earth. The hymn O Little Town of Bethlehem is a traditional hymn created in 1865. It is from a poem by Rev. Phillips Brooks, an Episcopal priest, and put to music by his organist Lewis Redner. The final verse is sung as an invocation in the Christ Tree, with the words "descend to us we pray” asking for God’s presence and healing on earth. Themes from music in eastern and western cultures, as well as joyful noises all morph through one another, in a manner inspired by Charles Ives, fading in and out of different human landscapes seen from the Christ Tree. Children as well as adults perform, just as they would if this were performed where the village orchestra idea originated - in Bali. The qualities of sunlight in Spain. On the tarnished gold grass of a plain. Can cause a painter to cry. That stained an indigo sky. To keep their ship afloat in its plight. His heart to its own cry for life. And the bands of a worried man’s strife. The sun parched suffering of Spain. On the languishing grass of a plain. I am truth, I am Life. I bring my kingdom without end. Peace I bring, my peace I give. This peace I leave with you. Don’t let them grow afraid. My love and I abide with you. And teach you things I’ve said. O Lord, our God, have mercy upon us. Look upon the faith of your people. Son of the men who walk on the earth, grant us peace. at the coming of the light, O Hilarious light, o life-giving light. Jesus, Jesus, Blessed is your name! Blessed is your company! blessed are they who will quicken to the word of life! freer of the captive souls who are bound in bitter loneliness. Jesus is love! Jesus is faith! Jesus is hope! one God now and forevermore! Amen! Often sung at funerals, the Psalm’s undaunted optimism in the face of death is reflected through the shimmering of all of the instruments in a combined impressionist mosaic, led by 12 string guitar (sounding more like a dulcimer), flute and harp. our Citadel, the God of Jacob. The Bird Song (4:02) is an instrumental work composed by the whole group and uses most of the instruments. The birds play as instrumental voices from within he Christ Tree branches, each with its own sound and presence, as the voices of many nations highlighted by Japanese Koto, African Belanji and Fly Wheel, and Native American Flutes. The version heard here is part of the "Christ Tree Live" concert on disk 2 of the 4 CD Christ Tree Box Set. This concert was recorded in 1974 by Calvin Hampton, noted composer and organist, at Calvary Episcopal Church, in Gramercy Park, Manhattan, NYC. Lift Your Weary Hand (1:52) is a selection from "A Potrait of Jesus Christ in Music", originally released in 1972 on cassette tape. The simple style of this music, with Venezualan folk harp, light instrumentation and vocals are representative of the early Trees music that many of our friends from that time remember and cherish. As the wind whispers through the trees. And make the buds to come to fruit in loving praise. And I will fill your heart with My rich blood. And mountains will be moved to save her. As ever I am with thee. 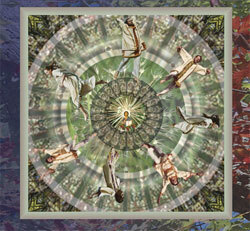 The Lyrics and music of "Lift Your Weary Hand" are by Katheryn "Shishonee" Krupa, and the arranged by all the Trees. This and several other songs from our early days only survived in the form of the cassette recording of "A portrait of Jesus Christ in Music", released in entirety on Disk 4 of the Trees Box set. The taping only happened through the efforts of a Santa Fe, New Mexico native named "Cherokee Darling". She fell in love with our music and recorded us in her tiny recording studio on the outskirts of town. Tim Renner of Dark Holler * Hand Eye then worked his magic to produce the 2007 re-release of both the Christ Tree Box Set and the Christ Tree CD Single. Your Name ... is an ointment poured forth ...(5:12) is a selection from a recording made of the Trees Music by the Monks of the Abbey of Gethsemani in 1973, released in entirety on the Disk 3 of the Trees Box set. An original song for harp, flute and voice, composed by Katheryn "Shishonee" Krupa, it is inspired by the Song of Solomon and the Psalms. Neither has he turned away his face from me. When I cried to him, he heard me. The stony hill into fountains of water. The Lord is sweet and righteous. He teaches the meek his ways. A flowing river of peace. All you that love her rejoice. Calling me to his breast. When I could not believe, he forgave me. In the shadow of your wings, I will rejoice. Psalm 44 (12:02) is a late "work in progress" recorded by the group in 1975. From Jewish and Christian hymns of worship to raw vocal expressions of distraught madness to comforting Cello interludes, this music crosses intersections of spirit, tradition, and musical genre from ancient to modern times. It carries influences from traditional folk to modern classical composition: from Aaron Copland in the American heartland to Béla Bartók in Eastern Europe, back to Charles Ives. Through it all is the weaving of both song and distress in and out of time, crying out to God. Interconnected with, or separate from, current events in the world, many of us feel that this work in particular resonates the timeless relevance of the Psalms. In days long ago by your hand. To plant them in the land you uprooted the nations. To let them spread you drove the peoples out. It was not by their arms they gained the prize. The light of your face because you loved them. Who won those victories for Jacob. Through you we overthrew our aggressors. For I do not trust in my bow. Neither does my sword save me. We conquered our enemies through you. You defeated all who hated us. All day long our boast was in God. Yet now you abandon and scorn us. You no longer march with our armies. And let those who hate us raid us with their armies. You make us like sheep for the slaughter. You scatter us among the nations. Why do you sell your people? And make us the laughing stock of all who come near. To make them toss their heathen heads. All day long I brood on this disgrace. My face covered in shame. A display of hatred and revenge. All this happened to us though we have not forgotten you. We have not withdrawn our hearts. And threw the shadow of death over us. Wouldn’t you have found it out? You know the secrets of the heart. For you our lives are being sacrificed. Wake up Lord! Why are you asleep? Get up! Don’t reject us forever. Why don’t you listen Lord? You forget we are being exploited, cheated, oppressed. Redeem us for the sake of your love. Initially Composed by “Shishonee’ Katheryn Krupa and then composed together with all Trees Community members at that time, including Marguerite Blythe Katchen, Stephen Gambill, Shishonee Katheryn Krupa, Shipen Lebzelter, David Lynch, and Mary McCutcheon Vukman. The Annunciation(3:33), recorded live in 1973 by the monks at the Abbey of Gethsemani. The work is plainsong flowing over Indian Tamboura (the drone instrument). To the place where Mary prayed. With favor that his promises you keep. Yet God has chosen you most fair. Be it unto me as you will. And left her praying and alone. The Symphony of Souls (3:19), recorded live in 1971 at the Abbey of St Gregory in Three Rivers, Michigan, was our original form of spontanous spiritual singing. This was the partially harmonic, partially dissonent contemplative sound that first came about from prayer in our New York City loft, where we spent the long night singing, and then sleeping in tents pitched on the attic's hardwood floor. Thus the early sound inspired the community's original name of "The New York Tent City Symphony of Souls in Christ." From there the symphony found its way into the depth of subway stations, upward to the clerestory heights of the Cathedral of St John the Divine, and then outward across the American Open Road, accompanying our pilgrimage without a destination on an itenerary of faith in a converted 1973 GMC School bus. Baptism (7:12 -- recorded 1973 at the Abbey of Gethsemani) Small tastes of locusts and wild honey evolving an outpouring of the spirit at the point of Baptism. Who taketh away the sins of the world. And the rough way smooth. Behold, the Lord God shall come. Who are you? Are you Elijah or a prophet? and Jesus was 30 years of age. Jesus was 30 years of age. There is Such a Love ...that steals into the heart, planting a kiss on deep wounds... (1:14, recorded 1973 at the Abbey of Gethsemani) - A short original piece, to the point, and what we were all about. There is such a love. Planting a kiss on deep wounds. Such a Love, of such a love.